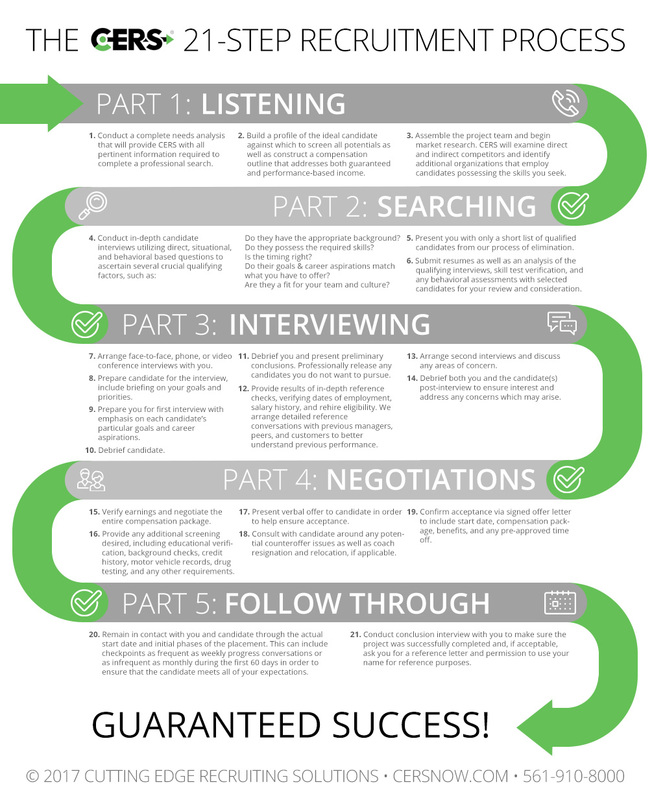 Understanding the desired outcome is possibly the most important part of the search process. If we don’t understand exactly what you want in a candidate, then the results of the search are useless. That’s why CERS concentrates on fully comprehending your situation first. This is where CERS’s experience really begins to count. We have the unique ability to identify the best talent in your marketplace, which means our target list will match your profile. This is where you validate if we have a match. We’ve already increased the chances of success by understanding your needs and presenting only the candidates who best meet your requirements. Next, we clear the path during the vital introductory process. Negotiations are often delicate and our experience in the area can help you navigate and avoid potential pitfalls. Our goal is to find, attract, and deliver the candidate that fits your criteria best, ultimately ensuring a win-win scenario for both you and the candidate. At CERS we believe that it is not over once the candidate signs the offer letter. Our post search quality programs are designed to ensure both retention and results from our placements.